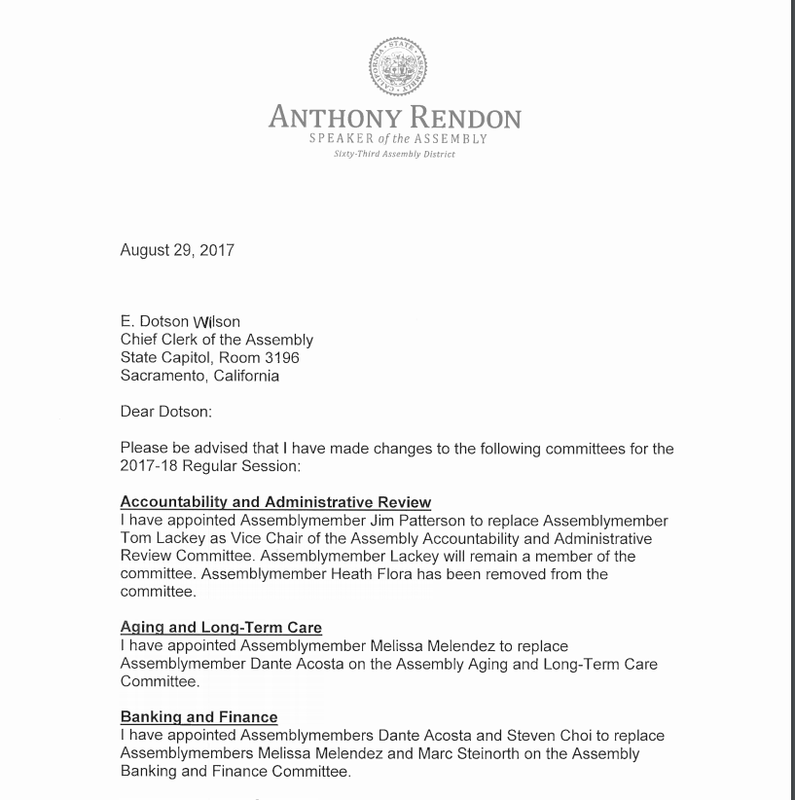 The soon-to-be-replaced California Assembly Minority Leader Chad Mayes – the turncoat Republican lawmaker who colluded with Democrats for the passage of a 10-year extension of the cap and trade program — made drastic changes in the Assembly committee assignments Tuesday, that would appear vindictive even to political novices. In a move that can only be described as “burn it down and leave,” Mayes stripped important committees from the conservatives in his own caucus who opposed his cap and trade vote manipulations, and reassigned them to… wait for it… himself. Mayes’ failure to lead on the disastrous cap and trade manipulations and vote allowed the cap and trade program to be voted on prematurely by two years, saved, and extended by a decade. And Mayes’ convincing six Republicans to vote in favor of it provided cover for three Assembly Democrats in targeted seats who couldn’t or wouldn’t vote for the cap and trade extension. Mayes’ exploits served no purpose other than to provide assistance to Democrats, and Gov. Jerry Brown’s bizarre obsession with climate change. This vote was pushed early so Gov. Jerry Brown could add this ‘win’ to his withering legacy. 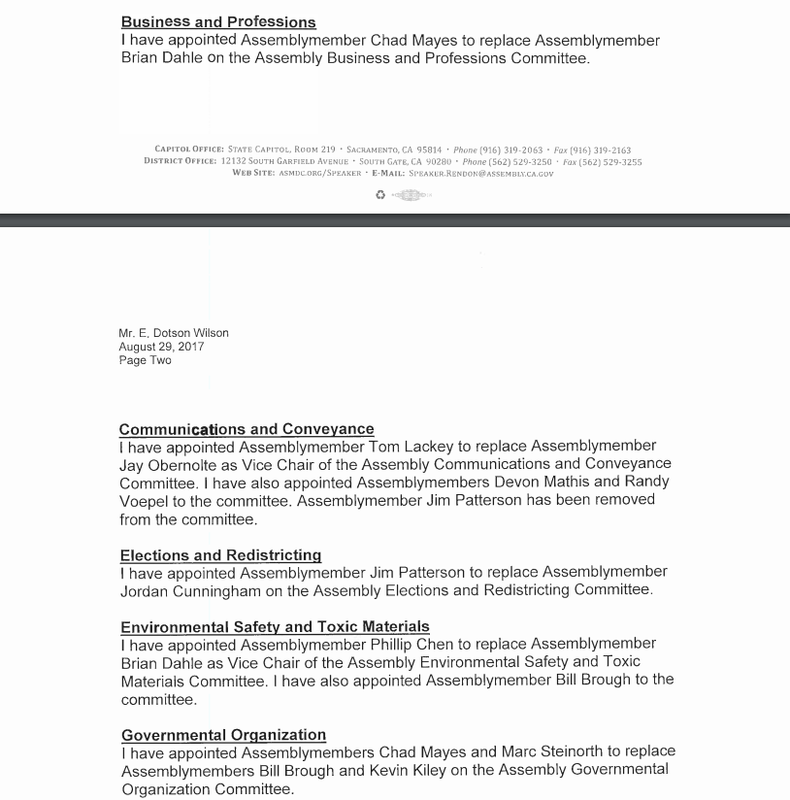 Mayes is apparently so blinded by his own greed, he even prevented incoming Assembly Minority Leader Brian Dahle (R-Bieber), of the committee assignment decisions. 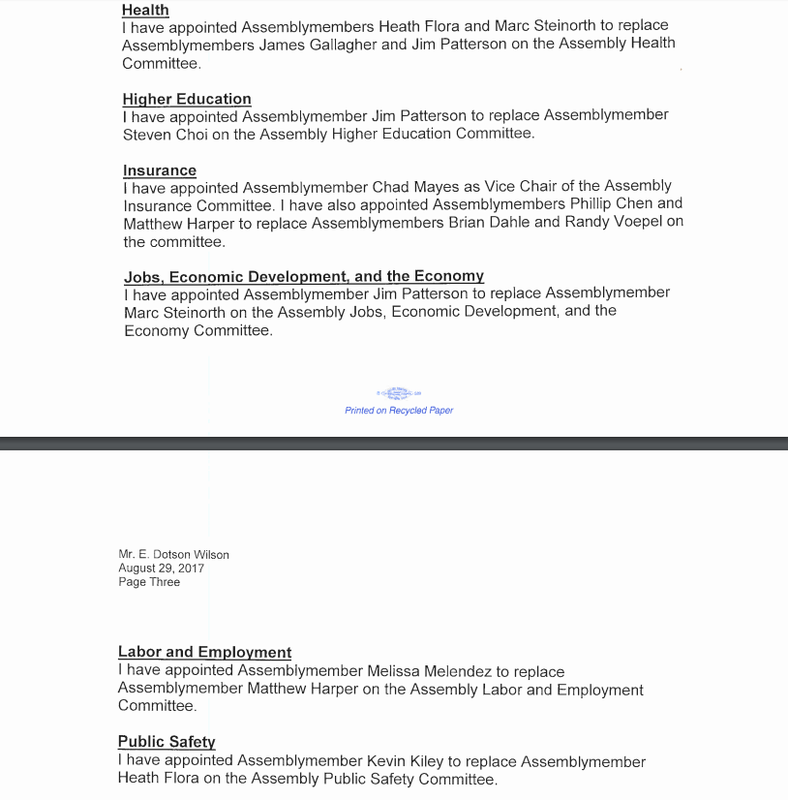 Mayes stripped Assemblyman James Patterson of every committee he was on, and put him on different committees. And remember, Mayes recently not only stripped Assemblywoman Melissa Melendez of her leadership on committees, he booted her from her office and moved her into “the Doghouse,” a closet-sized Capitol office. 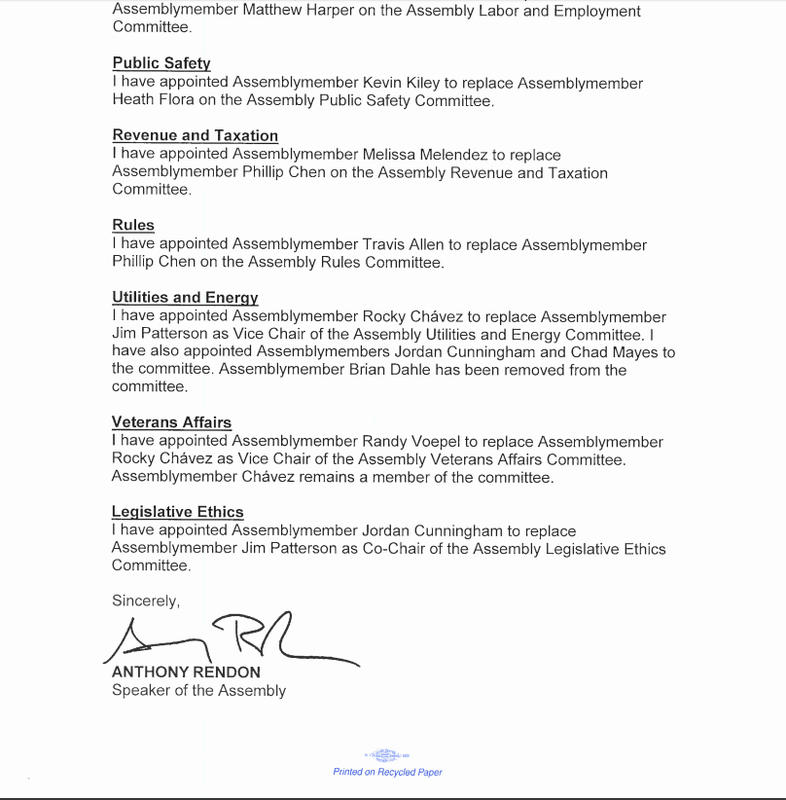 At this point, it appears Assembly Republicans are not unified. Some say Chad Mayes just blew it apart by punishing Assembly members Kevin Kiley, Bill Brough, Melissa Melendez (again), Jay Obernolte and James Gallagher. And I was told Mayes never bothered consulting incoming leader Brian Dahle on this debauchery. Mayes’ latest action is political treason. This is not about plum committee assignments; it is the parting shot at conservatives by a turncoat on his way out the door. It is petty and shows Mayes was never a leader, never a true Republican or Conservative. The Mayes massacre of conservatives has delivered Dahle a divided caucus, which hurts Dahle, and California Republican voters the most. Incoming Leader Dahle should reverse Mayes’ selfish massacre and start rebuilding the caucus – for the good of the Party. This entry was posted on Friday, September 1st, 2017 at 2:08 am and is filed under Commentary.